A change from the norm, with a variety of tonal options: comfortable although a little bulky. Not the most versatile bass. The vintage semi-acoustic design of yesteryear is making something of a comeback, with many a manufacturer looking for a piece of the retro action. Visually and physically, these are quite different instruments from your standard solid body electric bass but therein lies their charm - and they also offer a tonal palette that a solid body simply cannot supply, due to their acoustic construction. 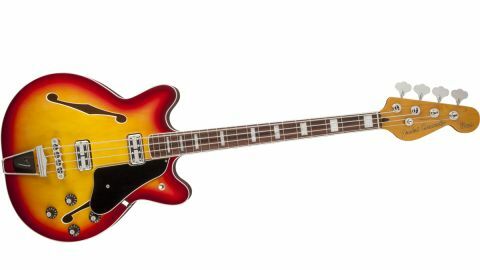 The Fender Coronado is priced competitively as part of Fender’s Modern Player range - so what do you get for your hard-earned cash? These hollow body dimensions either work for you or they don’t. Curvaceous is one way to describe the Coronado’s body: although there is no contouring, its laminated maple and alder body timbers work well with the Aged Cherry sunburst gloss finish, highlighting some striking timber figuring on the front and back, while the three-ply black scratchplate and white F-hole and neck binding are vintage touches. With a 40mm nut width and 19mm string spacing, the overall action, along with the reduced scale, gives the bass quite a loose, slinky feel, the neck proving very comfortable with a rounded C-shaped profile. These hollow body dimensions either work for you or they don’t. One or two frets in the upper neck area feel a little rough but not sharp by any means, and although the string height is a little high for my liking, a quick tweak of the truss rod will remedy that problem instantly. For such a large-bodied bass, there is a surprising amount of headstock bias, but placed on a strap this is unnoticeable. The bound rosewood neck features mother of pearl front block position markers, while black dots have been used on the side of the honey-coloured maple neck and the neck pocket is tight and well fitted. Strangely, the upper strap button is fitted on the edge of the neck heel block, making strap attachment a little odd. The Adjusto-Matic bridge and ‘F’ trapeze tailpiece, amp-style controls (two volumes, two tones and pickup selector switch), smooth operating elephant ear machine heads and chrome-covered Fideli’Tron humbucking pickups complete the retro look. Although the bass is hollow, so acoustic in nature, its slim body depth, compared to deeper acoustic basses, is unable to project a full bass tone. However, unplugged it is a fine sounding instrument, lively in nature and resonant, with a solid ringing quality. Fingerstyle playing rounds the sound out nicely, while playing with a pick highlights your initial attack on the string. The 30” short scale also has an effect on the tone due to the speaking length of the strings, but a longer scale length would have made the bass unwieldy and unplayable. Plugging in, the old school vibe truly comes to life. Tonally the instrument isn’t excessive in any respect: the rounded, warm bass-biased tones are traditional, which is no bad thing if you like plenty of ‘meat’ in your note choices. Fingerstyle playing rounds the sound out nicely, while playing with a pick highlights your initial attack on the string. It’s very much the sum of its parts and harks back to a time when these were the bass tones of choice - but matched up with a quality valve amp, we’ve no doubt this bass would put on a great display. Each pickup is capable of some really pleasing tones, and although this bass is fitted with steel roundwound strings, we could imagine it with halfwounds or flatwounds for a more authentic 60s sound. in both the visuals and the sounds on offer. The bass becomes more comfortable to play the more you return to it, and the bulkiness is soon forgotten, largely due to the highly playable neck. Speed merchants probably won’t give this a second look, but then it isn’t really aimed at that sort of player. It may be a little too close to Fender’s similar Starcaster bass for some players to be able to tell the difference, but we can definitely recommend the Coronado as an instrument worthy of further investigation.